A kinship diagram of part of the Western Jikany Nuer village of Nyueny, which Evans-Pritchard visited in 1936. 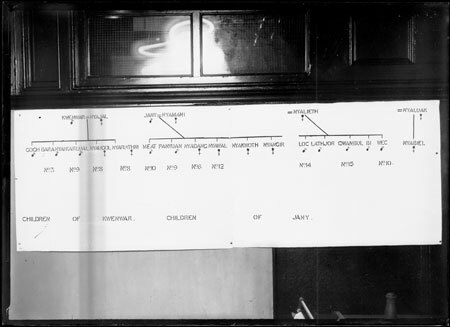 The diagram, on a large sheet of paper and written using stenciled lettering, is pinned to the interior wall of a building, almost certainly in Oxford, and probably in the late 1930s when he was Research Lecturer in African Sociology. Morton, Chris. "Nuer kinship diagram" Southern Sudan Project (in development). 03 Jan. 2006. Pitt Rivers Museum. <http://southernsudan.prm.ox.ac.uk/details/1998.353.66/>.